The current series of Tech Talks is aimed at discussing, in gradually increasing detail, where we are, and will be getting our oil and natural gas from over the next two decades. 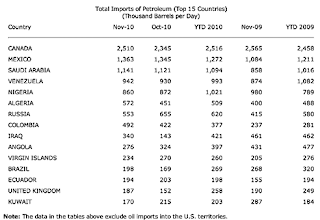 It is relatively easy to do a little hand-waving and say, as for example the BP review did, that Russia and Saudi Arabia are expected to continue to provide 12% each of the world’s oil supply through 2030 . It becomes a little more difficult to see that future if one accepts the rest of the BP argument that global supply will rise to over 102 mbd, requiring both Russia and Saudi Arabia to produce at about 12 mbd each through that time frame. 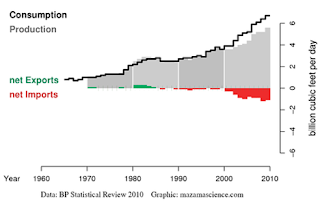 It is a little easier to check the validity of the projections if the totals are broken down into smaller pieces, and then examined by looking at both current and projected production from the different countries that supply significant amounts of oil and natural gas, not forgetting the increasing amount that each country is setting aside for its own consumption. We can also check on how that demand is growing. For example gains in the global economy has caused OPEC, in their February 2011 Monthly Oil Market Report (MOMR), to increase their projection of oil demand in 2011, anticipating a rise of 1.4 mbd to average 87.7 mbd. While the key questions are often focused on countries such as Russia and Saudi Arabia, however, it is in the second tier that more evident changes may be seen. 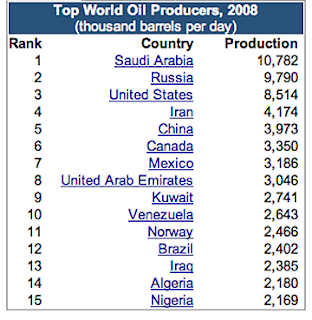 And as a reminder, we are reviewing the countries that were listed by the EIA as the top world oil producers, initially in 2008. And so we will begin today with a look at the case of Mexico, which ranked 7th in overall oil production, at 3.186 mbd, in 2008, is illustrative of the need to examine future projections with a little caution. Between those two dates Mexico’s overall production peaked, and started into decline. In December 2010 it produced an average 2.57 mbd of crude. 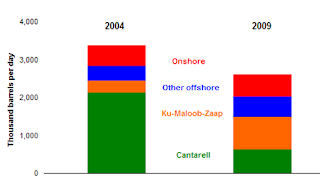 The giant Cantarell field, which at peak production reached 2.12 mbd, fell below 500 kbd last May. 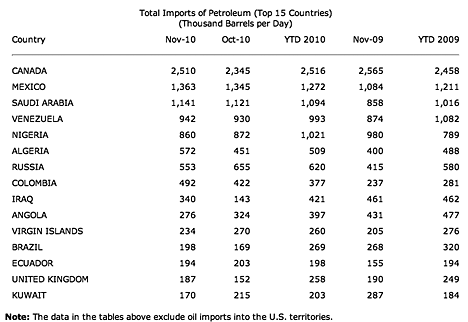 Mexico, remains one of the two largest importers of crude to the United States (the other being Canada) , but may well become an importer of crude by 2015. Which leaves one wondering where the US might make up that 1 .3 mbd ? Mexico consumed internally an average of 2.08 mbd in 2009. One reason to start with Mexico, which has now fallen to 8th, and to use it as an example is that if we go back to 2007, Sam Foucher at TOD was pointing to the predictions of both the EIA and IEA which foresaw Mexico maintaining production of around 4 mbd in 2010. His projection, that Mexican production would drop by 30% from the 2004 figure by 2012, i.e. to 2.59 mbd turns out to be much closer to reality. (Though as with some of these numbers one needs to be sure that apples are being compared with apples, since there are different values depending on whether NGLs are included in the totals. OPEC, for example, is still reporting that Mexico is producing at 2.9 mbd ). Mexico produces some 7 bcf of natural gas, but uses this internally, and more, so that it is an importer of natural gas, and likely to increasingly be so. 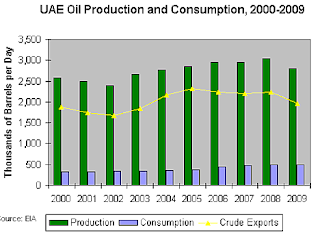 Moving from the troubled conditions in Mexico, the next country down the 2008 list was the United Arab Emirates, which in 2008 had averaged a production of 3.046 mbd. Remembering the decline in demand in 2009, it is not surprising that their output (as part of OPEC) fell in 2009 to average 2.795 mbd, OPEC reports that they produced some 2.35 mbd of crude in December 2010. There was an additional production of NGLs and condensate to give a total liquids production averaging 2.81 mbd in 2010. Consumption within the country has been steadily rising (435 kbd in 2009), and as a result, net exports have been declining. The UAE are one of the OPEC partners who can and do adjust oil flow to balance the market, and can thus potentially help with coming shortages elsewhere. 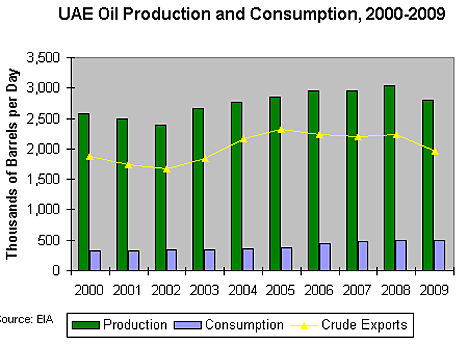 However the UAE anticipates being able to increase oil production to 3.5 mbd,, though not before 2018. One way of achieving this is through extended reach drilling, and the hope of thus being able to increase the ORR to 70%. Current production capability is estimated at 2.7 mbd. The UAE at present largely exports to Japan, South Korea and Thailand. The UAE has the seventh largest reserves of natural gas (at 214 Tcf ) However in 2007 domestic demand surpassed production. Part of the reason for this is that the UAE injects the natural gas into oil bearing formations to improve oil recovery. The demand is partly seasonal, with the use of air conditioning driving summer use to over 7 bcf. Up to 3 bcf of this is imported in the summer from Qatar, with only 4.5 bcf being produced by the UAE. While production is to be increased there is also the likelihood that greater supply will substantially further increase domestic consumption, so that the UAE are unlikely to be exporting in the near future. In much the same way as with UAE, Kuwait, as a member of OPEC has been controlling its production levels to ensure that prices stay “stable.” Back in 2008 Kuwait was producing 2.74 mbd and was 9th in the production stakes. It also has the second largest oilfield in the world, the Greater Burgan, after Ghawar in Saudi Arabia.. 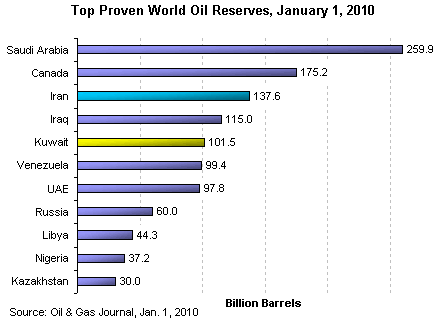 The EIA consider that it has the fifth largest oil reserves. 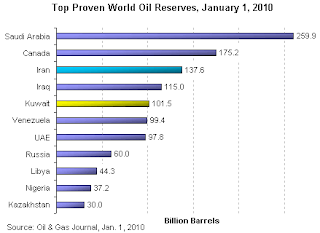 In January 2011 OPEC reported that Kuwait was producing 2.35 mbd, virtually all of which was exported. This in the month when OPEC production returned to the levels of December 2008. Last March Abdulaziz Alattar gave a talk on Kuwaiti oil strategies. The Kuwaiti goal is to reach a production capacity of 3.5 mbd by 2015, and to raise this to 4 mbd by 2020 and maintain it at that level. 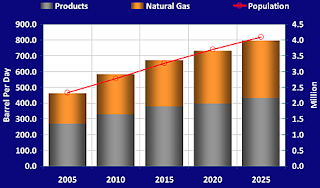 Concurrently they wish to raise the production of natural gas to 1.2 bcf/day by 2015, which will reduce the amount of natural gas that they currently flare off. In order to achieve this goal they will need to improve EOR capabilities and make the required investment in them. It should be noted that they recognize a difference between capability and actual production. And further they recognize that an increasing percentage of their production will be consumed internally. It was interesting to see this table of relative exploration and production costs, which was being used to encourage investment help in meeting Kuwaiti goals. 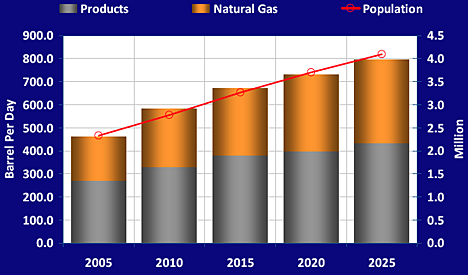 Natural gas increases are needed as much to provide for the domestic market as any other reason, as the plot above shows. For, at the moment Kuwait imports half the natural gas that it consumes. Additional supplies are needed to meet water and electricity needs, and so, instead of largely relying on the gas recovered from oil operations there is a new emphasis on producing natural gas directly. The next country down the list is Venezuela, but having posted on that country at some length recently, I think I will call a halt on the discussion for the evening. Thanks for sharing this kind informative blog! I was looking for Tier Oil , information and I see this beneficial blog.